Mathilde looks so gorgeous here www.newmyroyals.com/2015/10/king-philippe-queen-mathilde-visits.html and a new tiara for her! While Brussels spent in maximum security alert during anti-terrorist police operations span the weekend of 21 and 22 November, the King and Queen of the Belgians, themselves, were at thalassotherapy in Brittany. 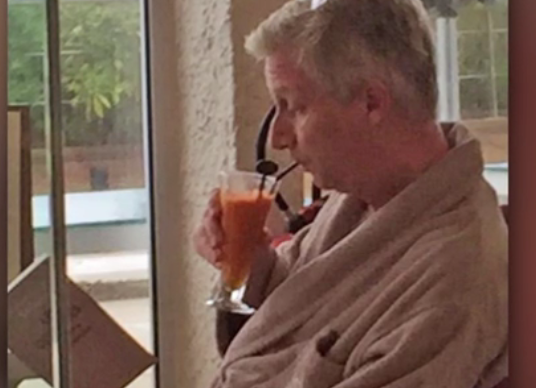 The picture published Wednesday in Le Canard Enchaîné should show, according to our colleagues of le Soir, King Philip "in bathrobe and sipping a cocktail." I was wondering but they were doing meanwhile the high alert in Belgium but it seems strange that they stayed in France. thank you, first time I saw them I LOLed really hard. However, though this would only be really funny in another conditions that it was meanwhile there was a high alert on Belgium is not a funny thing at all. This is the very first step these two have failed and it couldn't have been worse. Leaving the country in those conditions is not going to make him popular at all. His popularity is going to sink. The state of emergency was declared on Saturday and from the Dutch press I understand that the King had travelled to France on Thursday already. So he didn't leave AFTER or while the state of emergency was declared, he was already out of the country. Yes, he could have travelled back on Saturday but perhaps he was adviced not to by the secret service or police. We don't know what happened exactly and for security reasons the government won't say anything about it. To be honest I'm glad he was out the country already! Securing him and his posse would have been a logistic nightmare during level 4! It would have drawn police/army away from places that needed the protection more. He remained in contact with ministers all the time if things went really south he was close enough to swiftly return if needed. Isn't it likely that additional French forces were required to keep them safe on foreign soil? Or that additional Belgian forces had to be sent to that location? Especially after the alerts were issued? Something like these events happen, a trail leads to your country, and you head off on vacation? By being out of the country and away from secured royal properties, they required extra protections. Evenmoreso as events continued to develop. IMO, they should have returned home immediately, in fact they should never have left. Your country is under attack and you continue to hang around a French spa, clearly experiencing no stress, while your country and your four children are without you? BTW, the closeness of these photos make it look like an inside job. I believe french forces didn't understand why they stayed after the Paris attack. But I don't read french so I cannot find the sources. They didn't 'stay' after the French attacks. During the French attacks, the couple was in Belgium. On November 13 (the day of the attack) the King opened a fourth levy in Lanaye (Wallonia). On November 16, the Monday after the attacks, the King had a meeting with the Belgium prime-minister. It was only the weekend after, November 20-November 22, that the King and Queen were in Bretagne, which is some 400 km away from Paris. And as a rather rural area, it isn't high on the targets for any extremist group. The state of emergency was declared on November 21 when the couple was already in France. Moving back to Belgium, having them travelling into a city-under-siege, would have distracted the local security forces. In cases like this, it is a standard-operating-procedure to not move high-profile people (targets) into a dangerous area. And with todays modern communication equipment, the King and PM were in close contact I understand. You are welcome to your opinion, I am welcome to mine. Having useless foreign royals needing extra protections in the midst of everything else? That leads me to think it was the French guards who were so furious that they are the ones who leaked the photos. Or their Belgian guards who were also furious at the behavior of their new king. IMO, they should never have left Belgium, and they should have returned immediately once the situation deteriorated further. Getting them home safely, and out of France's hair, was more important than keeping extra French forces engaged in protecting useless foreign royals who wanted to hang around a spa instead of being a centering force for their people in a time of terror. They can be far better secured in Belgium, no matter what temporary inconvenience would have ensued. Looking at the pictures it is clear to me, they haven't a care in the world. At a time like this, photos like that are incredibly damning. ^I agree though they went before it happened and second the photos are also from before.